HEMCO Machine Company, 36200 Mound Road, Sterling Heights, MI, 48310 (810) 264-8911 donated one of their upper plenums as a prize for the recent Norwalk event. I was fortunate enough to win the upper plenum as part of the Quick-16 program. The owner of HEMCO Machine, Ralph Ascroft, was kind enough to ship it overnight to me. An examination of the piece indicated a radical new design as depicted in the photograph. As Ralph states, the goal of the design was to improve the air flow distribution to all cylinders, thus evening out the power generated from the engine. This is accomplished by changing the air flow path into the manifold by means of a physical design change. The new design incorporates a 90 degree turn with a narrow opening into the intake manifold. 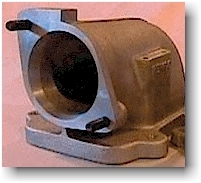 As Ralph stated, "This design makes the intake manifold think a throttle body is sitting directly on top of it." Ralph also claims his efforts were justified on both a flowbench and on an engine dyno., although I did not have the results. All of this sounds interesting, but the proof is in the performance, so off to the drag strip I went. The baseline performance was with the "stock" upper plenum installed. I say "stock" meaning that the previous owner had reshaped the interior of the plenum in order to gain better flow and distribution, but no flow bench or dyno. data were available for these modifications. The data indicates that the HEMCO upper plenum did increase the performance of my car. In reviewing the data It is more important to evaluate the performance increase based on the trap speed since the elapsed time can be affected by many variables, whereas the trap speed can be directly related to the engine power output with common mathematical formulae. As the data indicates, the HEMCO upper plenum increased the trap speed by approximately 1.4 mph on an average of three runs. It should also be noted that my original upper plenum had been modified to increase its performance, hence, if compared to a completely stock upper plenum, the gain in performance would probably be more pronounced. Overall, it appears that the HEMCO upper plenum would be a welcome addition to any motor with more benefits realized with a greater amount of engine modifications. If you are in the market for an upgraded upper plenum, then you should call Ralph at HEMCO for some additional information. The plenum accommodates the stock throttle bracket via a special bolt which is supplied. All other bolts and studs required for installation are also included. The upper plenum's price is $229.95 (+shipping). It is available in 58mm and 62mm versions. 12820 E. Nine Mile Rd.